Let’s start with the ugly (because I always like to end on a good note). But let me be clear, nothing could actually be called ugly in Paris. Not the sights, not the food, the wonderful people or experiences to be had. Paris should be accordingly adored and revered by all. I love her. But if you’re a tourist, there is some ugly and bad to be had…. 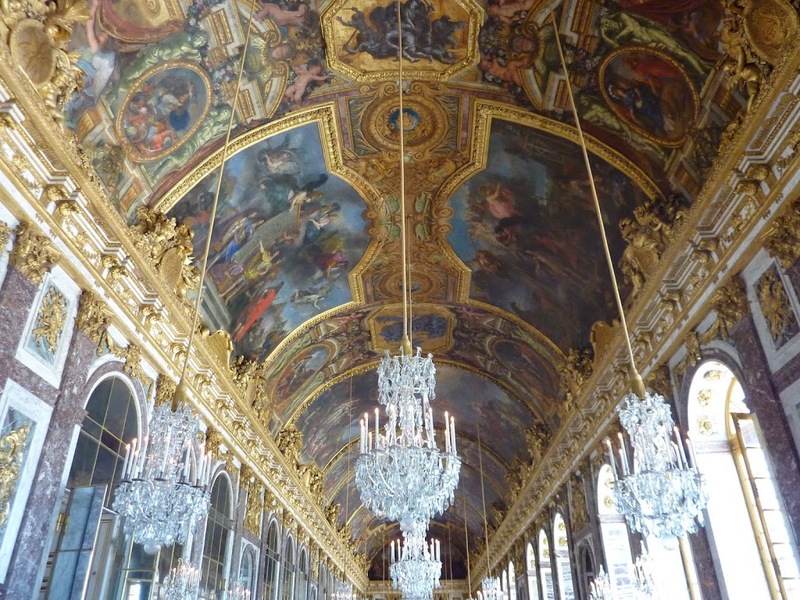 The Palace of Versailles. Not, in itself, ugly at all! The Palace is so gorgeous and sumptuous, with stories singing out from every corner and bouncing off the gold walls. Here is history if not personified, then made real in architecture. Here it should be easy to recall the extravagance of Louis XVI and Marie Antoinette and picture the struggling masses outside starving and baying for blood. Every ornately painted ceiling, every vast and sweeping marble staircase, and every lavishly furnished room should transport you to another time and place. You should be able to picture yourself strolling in the gardens, entertaining fellow aristocrats and generally living a selfish and indulgent life. But in fact what you’re most concerned about, right from the outset, is being in the right line and then fiercely guarding your place in it, careful not to let through any sneaky line hoppers who might get in approximately 30 seconds before you (you’re going to spend hours there, but still!). You approach the imposing, gilded frontage of Versailles with a sense of awe and wonder but before you’ve bought your ticket you’re defensive and antagonistic. You get worse. You start elbowing your way through crowds, mocking umbrella wielding tour guides, and rolling your eyes in disdain at those arrogant prats who insist on taking flash photography even though, very clearly, the signs say ‘no flash photography’. Normally you’re benign and easy going, but now you glare menacingly at the back of the head of the person who just squeezed into the tiny slice of free space in front of you. People lose their senses – they push in, they push you over and they push your limits of patience and decency. The Palace of Versailles with tourists edited out. Then there is the ubiquitous and annoyingly lengthy line up for the toilets. Here my travelling companion and I coined the term ‘a Versailles incident’ to indicate a toilet cubicle that has been so defiled by an unhappy incident as to render it unfit for human use. If you take a moment to think about it (and I recommend that, actually, you don’t) it’s difficult to imagine how that incident might have happened. We wanted to use the Ladies before we left the Palace, but three out of the four cubicles were decommissioned and the lady in the fourth appeared to be settling in for a while, resulting in a rather expensive but deeply satisfying detour to a nearby hotel lobby bar instead. Fellow tourists are ugly. Yes, yes, I was one of them. But somehow, others are always worse. Right? Stairs and urine. It’s a cliché I know, but endless metro stairs and the overwhelming smell of urine together are the undeniable ‘bad’ of Paris. A small price to pay, but none the less, it must be paid. The metro itself is excellent – quick, convenient and reasonably priced. But there were rarely escalators going up and never going down and so, at the end of a long day of endless walking, facing a long winding stair case made one sigh and frown just a little bit. In some metro stations the sour rancid smell of urine was overpowering. There seemed to be a little run off area against each wall – just wide enough to fit your foot inside. This was often the damp and undeniable source of the urine smell. Imagine then, my horror when I stumbled a little and stuck my scantily sandalled foot into one of these gutters. Had you witnessed this event, you would have seen my face silently transformed into the painting The Scream and my graceful but frantic backwards pirouette across the platform, arms windmilling, whimpering pitifully. A tentative examination confirmed that this was, mercifully, a dry gutter and that a soak in a disinfectant bath for 24 hours would probably suffice. Maybe. But oftentimes our forbearance of urine and stairs was rewarded with an amazing busking performances – a middle aged duo delighted a crowded, tourist-laden train with every hokey wedding reception song imaginable, complete with accordion and guitar. Then there were the funky hip hop artists who turned the carriage into an instant nightclub, and who pole danced and made people smile and take photos. Worth it. Where do I begin? There are so many very good things about Paris. Here is a city in which you have a moment to remember the special little things in life. And they’re simple. We spent an afternoon sitting by the Seine with fresh pastries and a bottle of wine. 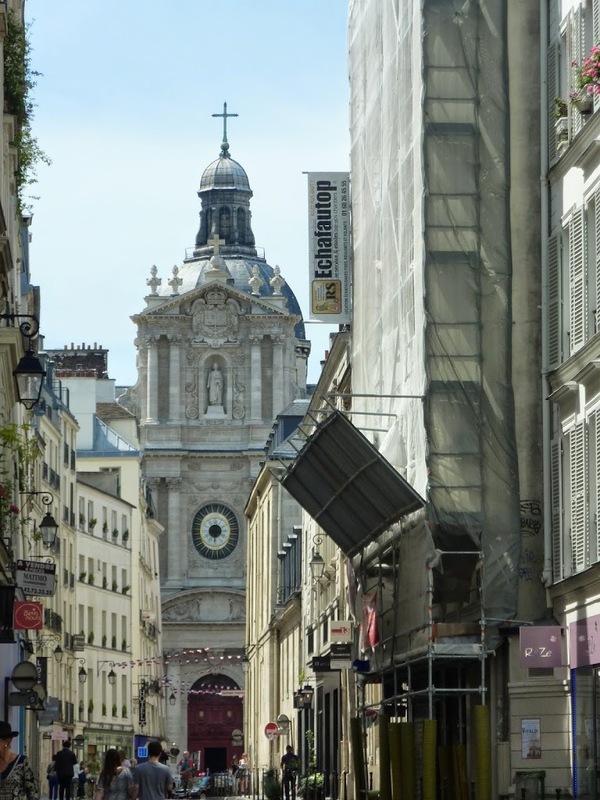 We strolled through the Tuileries Garden, soaking up the early summer sunshine, and we meandered through the grand apartments and boutiques of the historically significant Marais area. There we found a fresh food market and we admired the luscious colours and smells, unable to resist some sweet peaches. Paris is a city in which you can just be. Full stop. Good. Very good. One of the most wonderful evenings we had was also simple. 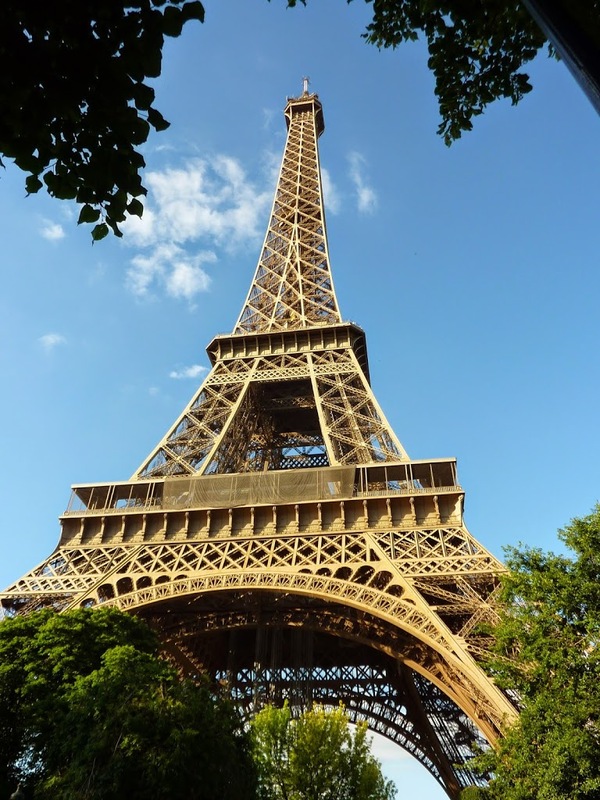 After admiring the Eiffel Tower – ever present, compulsory, enigmatic – we wandered across the Seine, up the stairs to the Palais de Chaillot to appreciate it again from afar. We casually wandered into the Trocadero café and sat ourselves outside, in full view of the Tower and the early Parisian night life. We laughed and chatted over yet another glass of wine but sometimes we sat silently, people watching, utterly content in the present. A young couple held hands and smiled into each other’s beaming faces; a middle aged man trudged past in his suit, muttering into his phone, looking tired and glad it was Friday; a gaggle of high heeled girls squealed with delight at meeting each other before clambering into taxis. The table next to us were organising their departure. The two men and a woman, all seemingly genuine Parisians, in their 70s or older, fussed with the cheque and each other. The woman went to freshen up before leaving and the two men took their time in collecting their things together and heading out the front to wait for her. They were both smartly dressed with jackets and a handkerchief in their pockets. Distinguished looking, but not stuffy. One of the men held the lead of a very small white fluffy dog who was suitably cranky and yappy. He cooed reassuringly at it but when the woman returned he gratefully gave the lead back to her. All three wandered off slowly, chatting amiably, relaxed. I wanted to be that woman when I was older – so obviously still engaged in life and enjoying it with friends. We left the Trocadero and wandered down the street in search of the Victor Hugo metro and it took us forever because we constantly stopped to peer through the most amazing window scenes of wealth and excess. The streets were getting dark and the chandeliers shone brightly. The buildings were impossibly lush and ornate and we wondered how people lived their lives in there. Did they think of their lives as extraordinary, I wondered? Or simply, wonderfully, just Parisian.